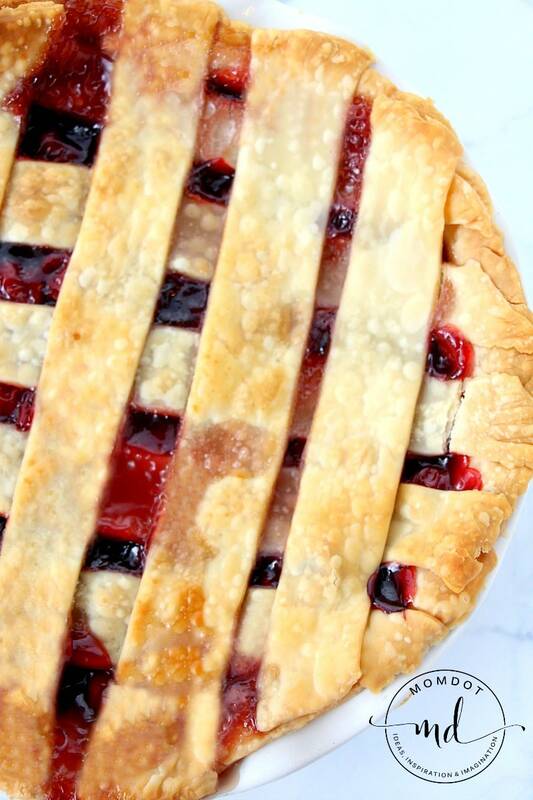 Classic cherry pie is well…classic. There will always be a way to enjoy fruit like this cherry cheesecake dip or this apple and berry pie, but nothing beats good rich old fashioned cherries wrapped in a flaky crust. The day before yesterday Charlotte, Chris, and I were watching some pie bake off on TV (our lives are thrilling) and I thought, oh, this is easy as …pie. Can you believe I have never made a pie before? We even had to buy a pie plate. That’s pathetic. I figured nothing to it but stirring and pouring, right? Well, notsomuch. 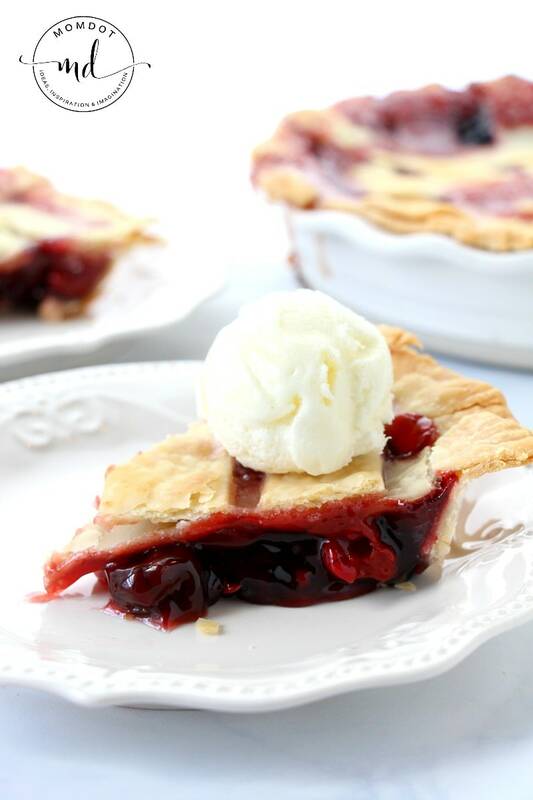 But it was fun and this classic cherry pie recipe was worth the time! What’s in a Classic Cherry Pie? Drain your cherries, reserving 1/2 cup juice on the side in a bowl. You will use this later. 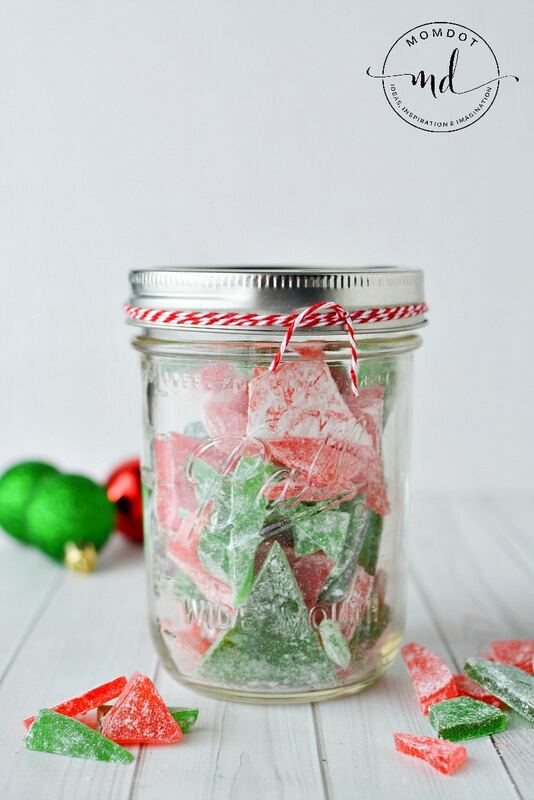 Combine white sugar, cornstarch and salt in one bowl and mix well. These are your dry ingredients. Combine the extra cherry juice, red food coloring , almond extract and lemon juice together. Mix. Now add this to your dry ingredient bowl. Add cherries and mix again. Add softened butter and let stand for 15 minutes. 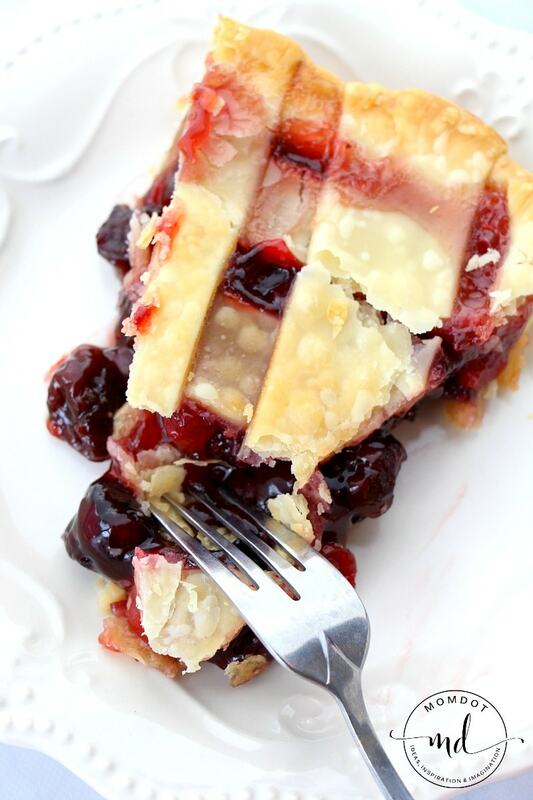 Pour your cherry mixture into pie crust and finish top with lattice work pie crust. Be careful not to overfill. TIP: You can use a pie crust saver here, which will guarantee your pie doesn’t burn the edges. You should def use one if you have one or buy one if you don’t! Pies are super sensitive on the edges and there is nothing worse than putting it all together and then having burns on the thin parts of the crust. Find cute kid to pour, stir, and taste test her fingers every 3 seconds. We used premade crust so while Charlotte was mixing up all the ingredients, I was reading the directions on the crust. It said to microwave it for 10-20 seconds. That’s a LIE. 5 seconds is fine. My 15 seconds on the first one pretty much melted it and put a ton of holes into the crust bottom. We had to patch it all over the place. It was enough to make your grandmother cry. Pour all the yummy stuff into the crust. Unroll another crust, lattice and add to the top. Put in oven. Check on pie. Realize you overfilled it. I had no idea you could overfill it. Don’t overfill. Take pie out. Now if you are not in the mood for pie, you can always try this super fun Brownies + Cupcakes Recipe, that is EPIC or even make up some edible dessert cups to serve extra cherry pie filling in! Of course no matter how beautiful or how messy your classic cherry pie is, its always tasty. And even more so when it has ice cream on top! Also, do not be afraid to use FRESH CHERRIES! Its easy with a cherry pitter …see Phoenyx demonstrate how to use one. Classic cherry pie is well...classic. Nothing beats good rich old fashioned cherries wrapped in a flaky crust. 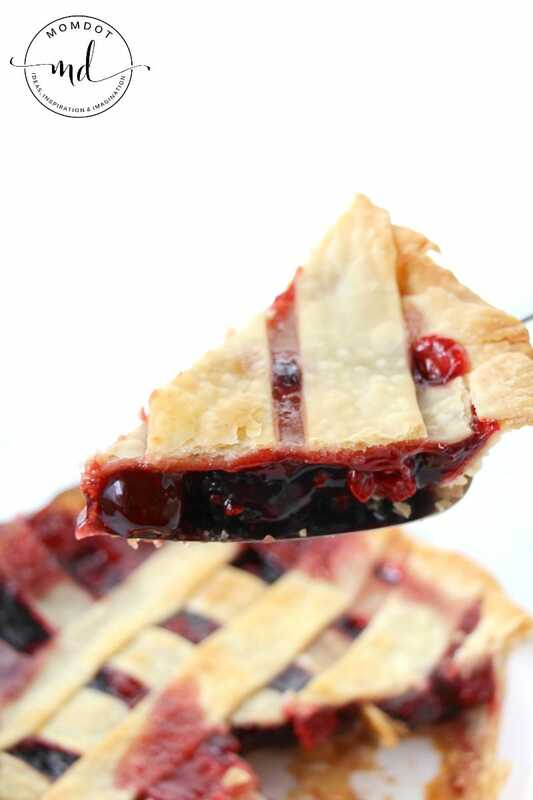 Learn how to make a classic cherry pie recipe that will knock your socks off and even make grandma say "That's so good!" Combine the extra cherry juice, red food coloring, almond extract and lemon juice together. Mix. Now add this to your dry ingredient bowl. Mermaid Cake Recipe: Nothing prettier than a layered mermaid ombre cake to bring out the fun in ANY season or birthday. Plus, no one needs a reason to get magical. Of course, going unicorn poop desserts is just as fun. how fun. I love to bake! Thats looks like you guys had so much fun. Our local church recently started a cooking class for the kids of the parish and it has been a great hit. On Sunday the kids decide what they want to cook and they take pictures of them cooking their masterpiece. We have had some really great photos and great stories how cooking has brought families back to together. Keep up the good work. On another note, another mom on my parish told us about a free tart cherry cookbook that you can download from Traverse Bay Farms. Here is the link if you are interested: http://www.traversebayfarms.com It is part of the free tart cherry health report. that does sound fun! thanks for the link! That looks so yummy, but it isn’t helping my case any lol. I’ve been a follower of your blog for a little while…and I love your real-life frankness. You’re not all sunshine and roses….which is awesome. Sara Bonds suggested I talk to you, but I wasn’t sure about how to go about contacting you because the forms I found were for PR and advertising. Maybe I’m as oblivious as some of the people you rant about…but I hope not!! I’ve recently collaborated with another blogger and we’ve come up with a website for weight loss. Sara said that in your forums there was a group of women trying to lose weight. I’d really like to get the word out about our site but we have little to no money for advertising. If you would take a look and let me know I’d love it…please? I think if we could get the word out this could be awesome! The blog is http://bloggestloserweightloss.blogspot.com please pardon me for putting all of this in a comment. just saw this! email me at trisha(at) momdot (dot) com and we can set you up with a membership on our forum to talk about it! It looks yummy! I was just saying to my husband I haven’t made an apple pie in a long time, but I make chocolate fairly regularly because my aunt’s recipe is super fast and easy. I’ve made quite a few pies myself. A good majority of them always run over, so always put a cookie sheet or pizza pan under it to catch all of the run off. ooh, pizza pan is a good idea! I would have picked cherry pie for my first attempt too. But, seriously, I can’t believe you didn’t have a pie plate. Trisha, really! Awesome Trisha, looks yummy ! I did my first attempt at some baking too yesterday must of been good cause it is all gone ! Sounds like a great pie! Don’t feel bad about it bubbling over. My mom made and still makes tons of pies and I remember many of her’s bubbling over like that. I think you did great for your first pie! What’s important is that it tasted good. Umm, my angry Asian family looks nothing like that cherry pie. On a side note, pretzels involve boiling in a baking soda solution and then baking. It’s kind of a PIA. not our recipe! We found an easy peasy one. I looks perfect to me! Love the angry Asian look! I make homemade pretzels with my kids all the time. They are pretty easy and fun because they can make them any shape they want. Mine usually make letters! This was kinda what i was thinking…she could do what she wants w/ them? If anything it will be like a playdo session. Yummmy! I think pies look prettier when they are gooshing out the seams anyway. Love the pics! and they taste the same! HAHAHAH angry Asian person. It looks delicious. Who cares if it’s pretty? It was yummy!! We let it cool for like 25 minutes so when we cut it, it was still warm and gooey. I keep coming back to this and salivating heavily.